There are many schools of Buddhism, and frequently (though not always) they have been very tolerant towards each other. Still, such a spirit of acceptance does not change the fact that quite naturally the adherents of any one school see themselves as pursuing the "best" form of Buddhism. Consequently they usually prefer to label their school simply as “Buddhism” and themselves as “Buddhists,” and they often object to names placed on them by outsiders. Thus, the designation “Lamaism,” which is sometimes used synonymously with “Tibetan Buddhism,” is one that Tibetan Buddhists themselves are not fond of. For one thing, it is inaccurate to refer to all Tibetan monks as lamas because the term has historically been reserved for those teachers of the Dharma who had achieved a high standing. Also, the distinguished monks of the Bön religion are called lamas as well, so the title includes more than just Tibetan Buddhist monks. To add to the potential confusion, some of the greatest figures of Tibetan Buddhism, such as Padmasambhava, were not even monks, and, thus not lamas. Nevertheless, the term emphasizes that, just as in Theravada, there is a significant division between the monks and the laity. Even if we're careful to avoid overemphasizing it, it is still there as an important feature. We will focus on this page particularly on how the lineage of lamas is propagated. Since the heads of various schools of Buddhism at times carried a lot of administrative and even political power, the matter of succession upon the death of a lama became extremely important. The two most obvious methods to identify who would be the next leader of a group would be a) selecting the person exhibiting the greatest capability, or b) passing on the status by heredity, that is to say, a son, usually the oldest, inheriting the leadership role from his father. There are problems connected with both options. The first option works well if there is an established mechanism by which the most eligible person is disclosed and accepted within a solid consensus. In order to work, it requires a system to which everyone was committed, such as formal elections. However, such a system and the necessary commitment to it are seldom available in human history, and the more likely result has been that splits and rivalries will appear. The second option, a hereditary position, works well if there is a capable son who has been prepared for the role and is ready to take leadership when it is conferred on him. But the complexities of life oftentimes interfere with the possibility of such a smooth transition, and so, once again, there are likely going to be disputed successions, rivalries, and regencies that sometimes turn into an opposition to the designated title holder. Tibetan Buddhism developed a third way of designating the successor, namely by the principle of incarnation. It is often referred to as tulku succession, where "tulku" refers a particularly holy person or even a Buddha or bodhisattva. The idea is that the distinguished man or woman (tulku) is always the same person. Demonstrating the compassion of a bodhisattva, rather than enjoying the ultimate bliss of Nirvana, he or she comes back lifetime after lifetime in order to teach the people and show them the way to spiritual release. One of the earlier implementations of this method came up in the context of the Karmapa order, a subdivision of the Kagyu school. At that point the Gelug order did not yet exist. You may have noticed in the preceding pages that Tibetan Buddhism has a great fondness for the bodhisattva Avalokitesvara. According to a legend, the Tibetan people are the offspring of Avalokitesvara (going under the name of Chenresig) and an ogress, and the bodhisattva has been especially fond of the Tibetan people ever since. This belief constitutes one of the mythological reasons why the Avalokitesvara mantra (“om mani padme hum”) has been so popular in Tibet. And, thus, it is also not surprising that, once a religious leader of superior standing should emerge, he should be considered an incarnation of Chenrezig. The first head of the Karma Kagyu order, Düsum Kyenpa (AD 1110-1193), fulfilled that role. The members of his order proclaimed him to be Chenresig reborn. After he died, his successor would also be Chenresig and, thus, he would be the same person once again returning to earth. His title was directly linked to the name of the order; he is known as the Karmapa. There have been seventeen Karmapas so far, though currently there is a split among the members of the order as to which one of two persons laying claim to the title is the true seventeenth Karmapa. This is not the first time that such a controversy has arisen, demonstrating that succession-by-incarnation is also not immune to creating divisions. 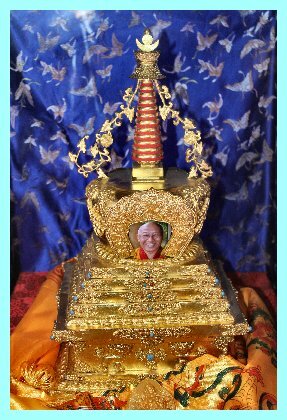 Another holy person in the Kagyu order is called the Shamarpa. He is believed to be the incarnation of the Buddha Amitabha. The tenth Shamarpa was a political schemer, who was eventually convicted of bringing about hostilities between Nepal and Tibet. By this time the Gelug order had achieved supremacy, and in 1792 the government decreed that there could be no more incarnations of the Shamarpa. If that order sounds a little too ambitious, we can simply interpret it as meaning that the Kagyu school was forbidden to look for any further incarnations of the Shamarpa. The sanction was finally lifted in 1963, and now there is a Shamarpa again. With the principle of succession by incarnation, the person who will hold the office is not known immediately. He will be a child who was born after the death of the former Lama. When he has been recognized, he is considered to be the same person as his predecessor. The process of recognition typically involves giving the child various tests. For example, those who are searching may present the child with several objects that include colorful toys and drab objects, such as the mala beads that belonged to the person of the previous incarnation. Theoretically, the child will recognize the possessions of his previous life and reach for them rather than the toys. Of course, it would not make sense to have every child of the proper age be considered a likely candidate. Oracles and prophecies will usually provide the team of searchers with certain geographic hints. Since the new incarnation is a child there must be a substitute or regent for him, which, again, could lead to strife and splits. However, the different orders usually have further mechanisms built into this system in order to maintain the continuity with as little disruption as possible. Take, for example, the Gelug order, which has a fairly complex system of succession. The head of the order is the Ganden Tripa (not the Dalai Lama). The title is based on the Ganden monastery, one of the main Gelug monasteries in Lhasa. His authority is confined purely to religious and monastic matters. The Dalai Lama appoints the Ganden Tripa for a seven-year term, based on his achievement within the monastic hierarchy, and his lineage is not based on the reincarnation of previous office holders. As of this writing, there have been 102 men who have held the office of Ganden Tripa. 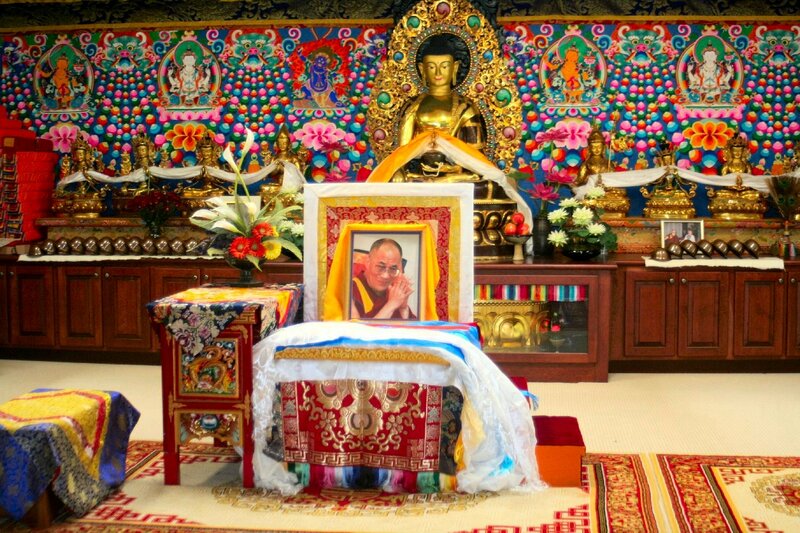 The Dalai Lama holds spiritual and, most importantly, political authority. From his time of the third holder of the office on, the Dalai Lama has been recognized (oftentimes more in theory than in practice) as the temporal ruler of all of Tibet. Traditionally, he will have been prepared for office in the Drepung Monastery in Lhasa, and his residence, once he is installed, will be the Potala Palace. The title is a contraction of a term bestowed on the third incarnation of this person, and the most common rendering of it is, "The Lama whose Wisdom is as Great as the Ocean." During the times when the new Dalai Lama is not yet known, or when he is too young to rule, a regent, called Ceti, governs on his behalf. But he does not have exclusive power. Alongside him there should be the Panchen Lama. The meaning of this title goes back to the Indian term "pandit" or "pundit," a "wise scholar." His traditional place of residence is at a monastery in Tashilunpo. 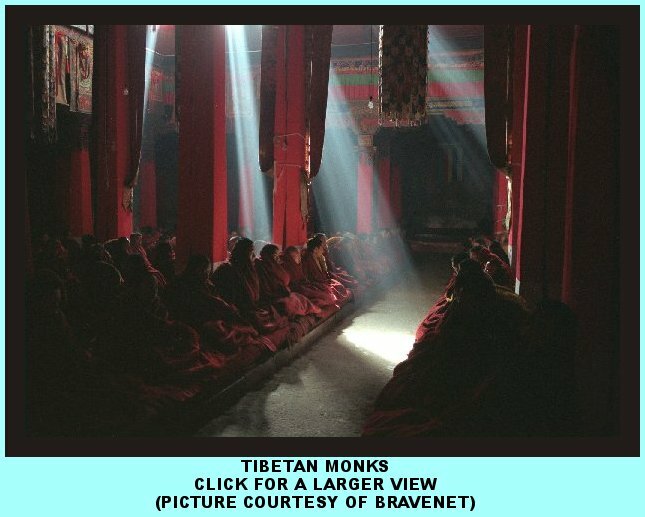 He also does not carry the same amount of political authority that is ascribed to the Dalai Lama, but in Tibet the dividing line between the spiritual and the political realms is often very narrow, as we mentioned in the introduction. Ideally, the Panchen Lama and the Dalai Lama belong to different generations. Thus, hopefully, there will not be a time when both of these leaders are missing. When the search is on for a new Dalai Lama, the newly discovered designee will not hold the office until he has been certified by the Panchen Lama. Reciprocally, the acceptance of a new Panchen Lama depends on the stamp of approval from the Dalai Lama. Now we need to return to some historical events in order to exemplify how these principles have worked out in reality. We mentioned on the first page of this section that for a time there was quite a bit of rivalry between the Sakya and Kagyu schools. The Sakyapas limit the succession of their leaders to a particular family, the Khon clan. This school started when a man named Konchog Gyalto set up a monastery in a town called Sakya. His successor, Kunga Gyaltsen, was so distinguished that he was generally called Sakya Pandita. He lived during the time of the Mongols' greatest power. Kublai Khan took over the entire Chinese empire, but he was content to have Tibet remain a mere colony. In AD 1246 Sakya Pandita accepted a document asserting that the Mongols held authority over Tibet. The Mongols, in turn, helped to establish the rapidly growing Sakya order as supreme, and Sakya Pandita's son, Pagpa, became Kublai Khan's personal mentor in Buddhism. Tibet needed to pay tribute to the Mongols, but due to this arrangement the Sakya school quickly became dominant, both religiously and politically. However, we should not think that the order or its head held absolute central power. Not everyone was happy with this structure. A stalwart student of Buddhism, Jangshub Gyaltsen by name, refused to recognize the Mongols as overlords or the Sakya school as conveying final truth. 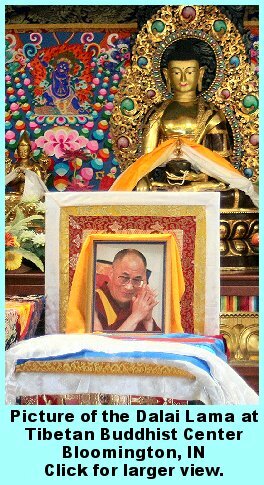 He initiated the Kagyu order, at whose head stood the Karmapa. Jangshub Gyaltsen endured much persecution for his views, but in bloody battles his army eventually defeated the army of the Sakyas. Eventually, the Kagyupas managed to hold sway over all of Tibet. The Sakya monasteries remained, but the Kagyupa monasteries flourished, and political power lay in the hand of the Kagyupas and their lay sponsors. Unfortunately, life in the monasteries was rather lax, and some of the teaching third-rate. A monk named Kunga Nyingpo became dissatisfied with what he was being taught and started to look for different mentors. He finally found someone who met his expectations in a teacher named Rendawa. This lama opened up a whole new world of understanding for Kunga Nyingpo, who became known for his home town, Tsongkha, as Thongkhapa, "the man from Tsongkha." 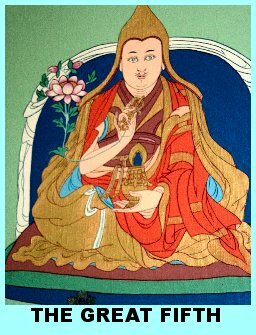 Tsongkhapa wrote two large works, The Great Exposition of the Stages of the Path and The Great Exposition of the Secret Mantra. Once he had gained some support, in 1409, he started the first annual prayer festival in Lhasa. A disciple of his, who had also studied under Rendawa, became the abbot of Ganden monastery, and under his leadership, the Gelug order, the "Yellow Hats," formed itself. What was it that Tsongkhapa had learned from Rendawa that opened up a whole new vista on Buddhism for him? Apparently it was the Madhyamaka school of Buddhist philosophy. Up to that point, the Tibetan lamas had roundly rejected the intuitive approach of Chan (Zen), which was making great headway in China. They believed that the way to enlightenment required scholarship, learning, and a lengthy time span of discipline, all of which was consistent with the Yogacara school. The Gelug movement changed that. 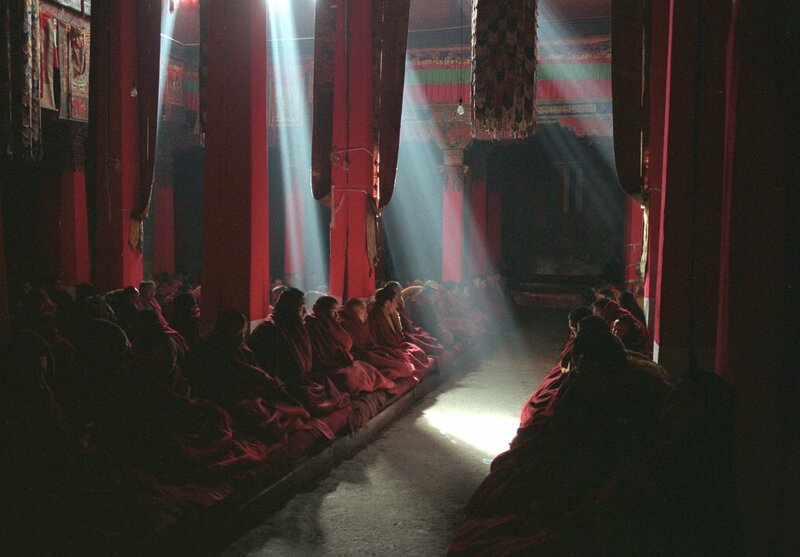 Nowadays all four schools of Tibetan Buddhism lay claim to being in the Madhyamikan tradition; however, it was the Gelug school that first introduced it in a consistent manner. By AD 1480, there was serious conflict between the new Gelug and Sakya orders. Sonam Gyatsu, who was the leader of the Gelug order of the time, took a page out of the Sakyas' book. He turned to the Mongols for support, and it was he who received the title of Dalai Lama from Altan Khan. Also, even though the principle of succession by incarnation had been practiced with regard to him and his predecessor already, he was now (at least among his followers) said to be the incarnation of Avalokitesvara, with the Panchen Lama stepping into the role of incarnation of Amitabha. Sonam Gyatsu was the celebrated third Dalai Lama. The fourth Dalai Lama, Yonten Gyatso, holds the distinction of being the only non-Tibetan Dalai Lama. He was born in Mongolia, but, despite some opposition, the Tibetan establishment (the Nechung oracle, the Panchen Lama) affirmed him. Needless to say, the growth of the Gelug order and its rise to extraordinary power did not please the Sakyapas or Kagyupas. However, the fifth Dalai Lama managed, again with the support of Mongol troops, now under the leadership of Güshi Khan, to assert himself as the sole ruler of Tibet, answering only to the Mongols, who kept representatives in Lhasa. Ngawang Lobsang Gyatso is traditionally referred to as the Great Fifth. His rule was a time during which Tibetan culture flourished. As the influence of the Mongols waned, the Ming dynasty came to power in China, and, even though cordial relationships were maintained much of the time, China now held superior power over Tibet. This state of affairs continued when the Manchus eventually conquered China and installed their leader as Emperor of China under the label of the Qing dynasty. Uneasy with the disputes that arose in connection with the incarnation system of succession, the Chinese imposed on the Gelug order a new system, according to which the names of all candidates for Dalai Lama should be placed on scripts of paper in a golden urn with the office going to the one whose name was pulled. This typically Chinese manner of settling issues was never accepted by the Tibetans, and it was only used once, under duress, to select the eleventh Dalai Lama. Few Dalai Lamas actually exercised their offices for any great length of time. The sixth Dalai Lama, Tsyanyang Gyatso did not want to be a lama at all, let alone an exalted one. He preferred to write poetry, spend intimate time with women, and drink wine. Of course, he could not abrogate his identity as the Dalai Lama since that was something that allegedly came to him by birth, but he refused to function in the capacity. Interestingly, as absurd as the situation was, the Tibetan people tend to think fondly of him, though at the time there was also some strong opposition to him, which gave rise to the first controversy in the incarnation model for the succession of the Dalai Lama. Because of the worldly life style of Tsyanyang Gyatso, another man had been installed by a minority of Tibetans. Regardless of whether he had been the right choice initially, his supporters believed that after Tsyanyang's death he was the obvious person to remain in power. But he did not have popular support, and the Nechung oracle pointed to a boy named Kelzang Gyatso as the seventh Dalai Lama. Most other Tibetan leaders agreed with this choice as well, but they had to proceed cautiously in order to prevent harm from befalling the boy if violence should break out over the dispute. It took the cooperation of the Chinese Emperor and his army to enthrone Kelzang Gyatso. It was not until the thirteenth Dalai Lama that a Dalai Lama really exercised power again. From the eighth through the twelfth, each of the designated lamas either died before they were old enough to rule or passed away a short time into their reigns. Thus, for quite a while, Tibet was governed by various regents. Thubten Gyatso (1876-1933), the thirteenth, was a forward-looking leader. During his time, China was in turmoil, the British were controlling nearby India, and Russia was a darkhorse contender in the colonial competition, at least according to British perceptions. These circumstances gave Thubten Gyatso the opportunity to declare Tibet an independent, sovereign state. However, no other country gave Tibet official recognition. He had to leave the country twice as a cautionary measure during invasions by the British and the Chinese. In the process Thubten Gyatso learned much about social and technological advances in other countries, and he attempted to modernize Tibet in various ways. The system of succession by incarnation has received a jolt from the fourteenth Dalai Lama, Tenzen Gyatso, the present holder of the office. As is well known, he currently resides in India heading up (until recently) a government in exile. In 2011 he officially abdicated his status as absolute ruler of Tibet in favor of a parliamentary form of government. Furthermore, he has made a number of statements questioning the need for any further Dalai Lamas, which has irritated many people who have said that it is not up to him to decide whether there will be another incarnation or not. The Dalai Lama has also declared that, if there should be another Dalai Lama, he would not be born in a region controlled by China, which at the present time rules out Tibet as well. The latter statement has particular significance in light of the controversy surrounding the Panchen Lama. The tenth Panchen Lama, Lobsang Gyaltsen, had cooperated with the Chinese government when China invaded Tibet. However, in light of the destruction caused by the Chinese, he changed his mind and wound up in prison. After his release he continued to speak out concerning conditions in Chinese-controlled Tibet, and he died suddenly of unknown causes in 1989. The search for a new Panchen Lama was effective. 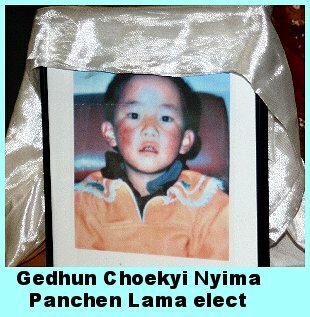 It resulted in the acclamation of six-year old Gedhun Choekyi Nyima in 1995. The Dalai Lama gave his official affirmation of this choice, which is crucial since the Dalai Lama and Panchen Lama can only hold office with each other's approval. However, the Chinese government abducted him to an unknown location, under the claim of looking out for his safety lest he be kidnapped and raised among the exiles. Then, in a move that seems to be somewhat inconsistent with the previous statement, the Chinese government invoked the principle of the "Golden Urn" and acclaimed a Panchen Lama of their own choice, Gyancain Norbu. The Tibetan people have steadfastly refused to recognize Gyancain. Both men are now in their mid-twenties (assuming that Gedhun is still alive), which means that the Panchen Lama will presumably have a strong voice in the selection of the next Dalai Lama. If Gyancain will actually hold the office, the chances are good that the next Dalai Lama will be a supporter of continuing Chinese control of Tibet, and the current Dalai Lama is trying to prevent such a scenario as best as he can. On the next page we will have some more observations on this situation.